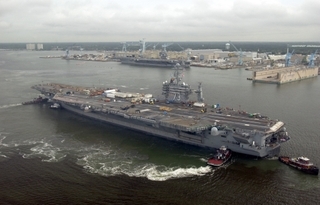 NEWPORT NEWS, Va., Sept. 1, 2005 (PRIMEZONE) -- Northrop Grumman Corporation (NYSE:NOC) has completed the seven-month dry dock portion of work for the USS George Washington (CVN 73) maintenance availability. The carrier was moved by tugboats to a shipyard pier on Aug. 31, where it will remain for approximately three months undergoing final work completion and testing. The George Washington arrived at Northrop Grumman's Newport News shipyard on Jan. 28 for the 10-and-a-half month maintenance availability. "I am very pleased with the efforts by all that were involved in allowing us to leave the dry dock, not just on time, but actually four days early," said Capt. Garry White, commanding officer of the USS George Washington. "Over the last seven months, the combined efforts of the ship and the shipyard have been incredible. We have truly formed a highly effective, cohesive team that consistently overcomes obstacles."